Needless to say, having a backup of your data has become imperative these days. Many of us take this for granted only to realize the importance of having a backup once a problem occurs. Losing data and not being able to recover it mean losing days, weeks, or even months of work. Not to mention what could happen to your precious digital memories. That’s why each one of us needs a reliable software for creating backups and restoring data. 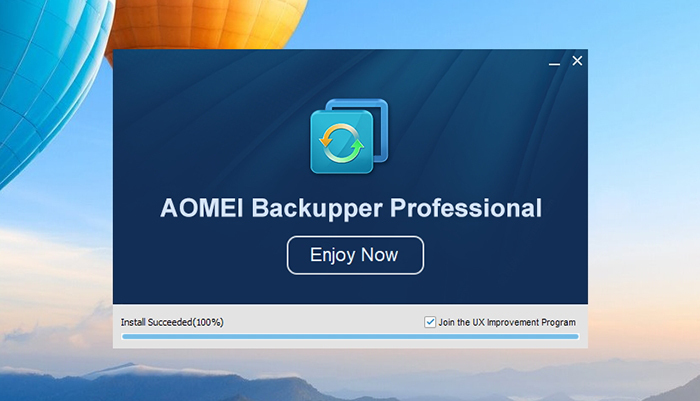 Therefore, we’d like to welcome to our review of AOMEI Backupper Pro. You are most probably reading this article because you’re looking for a backup software solution. To help you get to know AOMEI Backupper Pro a bit better, we are going to list the basic facts first. So, here they are. 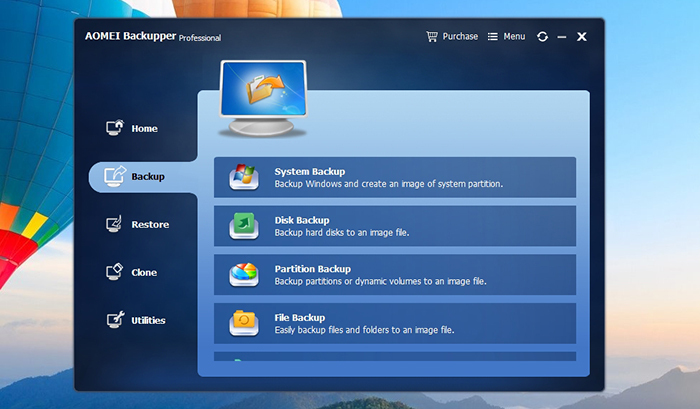 Unique Features A complete backup solution; Restore tools included; Disk clone tools; Maintenance features. As you know by now, this software is created for those who use Windows OS on their computers. In addition, this is a fully-featured solution that doesn’t only let you create backups, but also restore data and perform advanced maintenance tasks. Before we start digging deeper, here are the biggest pros and cons of AOMEI Backupper Pro. Pros Very easy to use; Fast & efficient; Comprehensive backup and recovery tools; Great customer support. Cons Not for creating automatic online backups. Final Verdict If you’re looking for a tool to create backups and store them locally, AOMEI Backupper Pro is the perfect solution. Finally, let’s jump to what you’ve been waiting for. Continue reading this article to learn the specifics of this interesting software. If you take a look online, you will find dozens of backup solutions. Even though all of those will get the job done, they are not the same. You want a tool that is easy to use, that performs without hogging your computer, and you also don’t want to spend too much money. So, let’s see how AOMEI Backupper Pro ranks and what this software has to offer. 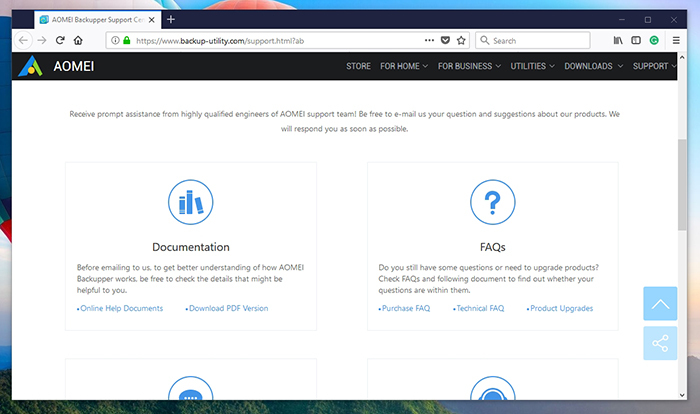 Before we jump to the full review, you need to know that we have tested the AOMEI Backupper Professional, version 4.0.6. The tests were performed on a two-year-old Windows 10 notebook, powered by Intel Core i7, 16GB of RAM, and an SSD drive. This is well beyond the application’s recommended specs, making us sure that older computers will run it equally fine. If you have a Windows PC, you will be able to run AOMEI Backupper Pro without any issues. However, this means that MacOS users will want to look elsewhere. Our Score: 7.5/10. These days, creating backups has never been easier. There are all kinds of different solutions and all of those are trying to bring something new. One of the latest trends is cloud backups. These are great because they run in the background, doing all the work by themselves. However, these will make your computer’s fan to run at all times. That’s why a simple backup solution is always better. AOMEI Backupper Pro is the perfectly simple (in terms of ease of use) solution that runs on demand. You can download and install it without having it take too much space. Once installed, it takes around 200 MB, which is great for this type of software. In addition, it doesn’t require you to have a powerful PC. We’re sure that not many of you are still using Windows XP. Even if you are, AOMEI Backupper Pro will run just fine. Upon downloading the software, you will have to go through an unbelievably simple installation. You won’t find any adware or bloatware here. Our Score: 10/10. 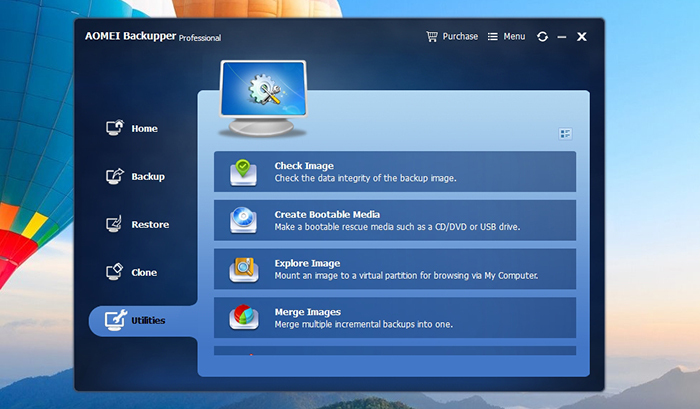 To get started with this backup tool, you first need to download it from its official website. There’s a Standard version of AOMEI Backupper that doesn’t cost a thing. 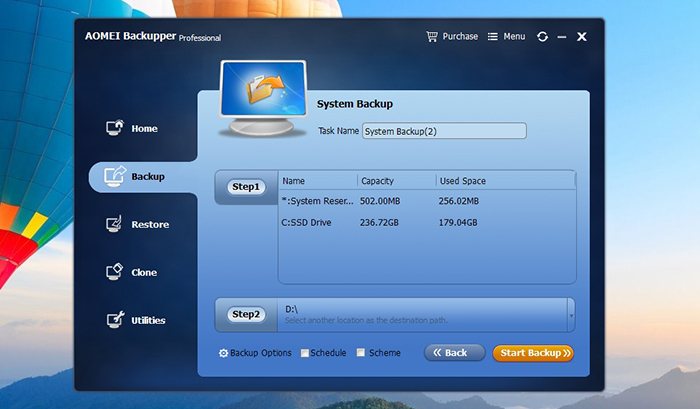 However, the Pro version unlocks numerous advanced features that will really help you take control of your backups. No matter which version you pick, you will be greeted by the Installation Wizard upon downloading and running the installation file. All you have to do is to click on the prominent ‘Install Now’ button and wait a few seconds. In our case, it took around one minute for the software to install. Once the process is done, you can click on ‘Enjoy Now’ to run the application. Also, please note a small button in the lower right corner. By default, you will join the UX improvement program. If you don’t want to send any data (and this seems to be pretty harmless), simply untick the box. Now, you are ready to jump into the software. Even though the UI does seem a tad outdated, it’s very intuitive and easy to use. Even complete beginners won’t have any problems find their way around the application. Our Score: 9.5/10. Once you install and open the application, you will see a fairly simple interface. On the left side, there is a sidebar with the most important groups of tools. Those are Home, Backup, Restore, Clone, and Utilities. We’ll see what kinds of options each of these bring. Home is the first screen you’ll see every time you open the application. By default, it will allow you to create a new backup or restore once you start using the software. Backup provides numerous different options. First, you get to create a System Backup that backs up your Windows installation, settings, and pretty much everything else. There is also a helpful Disk Backup that copies your entire hard drive’s contents. This is the most comprehensive type of backup, which also means it will take a lot of time to complete. In case you’d like to speed things up, you can go for Partition Backup or even File Backup that allows you to select a group of files and back them up. 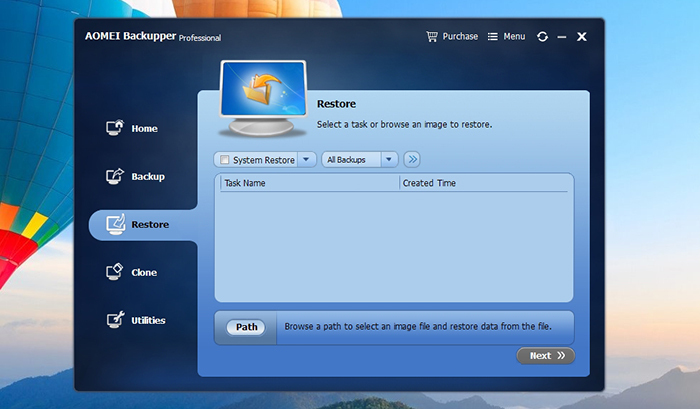 Restore is a tool that you use to return backed up files to their original location. At first, this list will be empty. 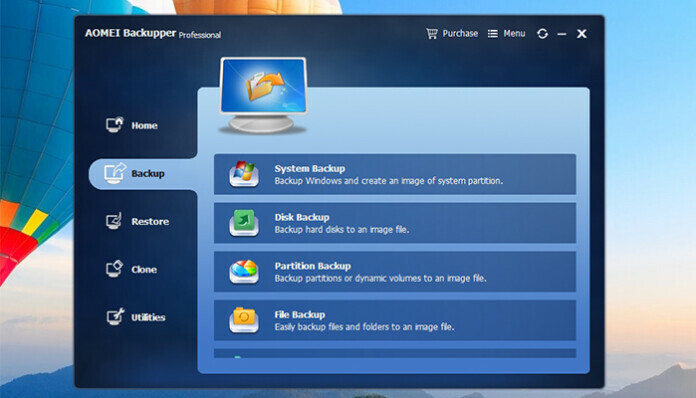 As you start creating backups, the list will populate with items. Simply select a restore point, click on ‘Next’ and proceed with restoring the data. 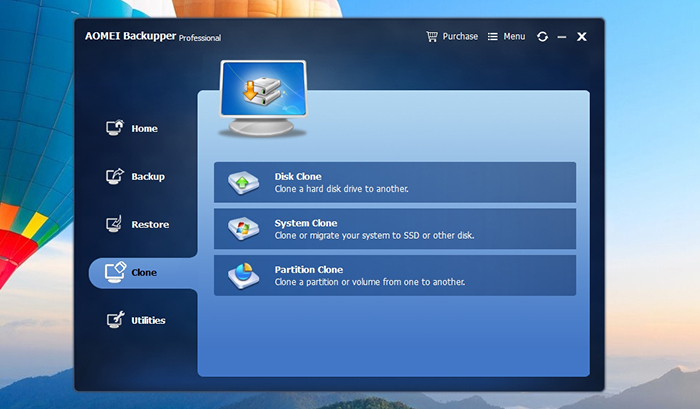 Clone is another way to keep your files as well as your system safe and secure. Instead of backing up files, you can create an image file that is identical to your hard drive’s original state. In other words, you can create an identical clone. This process can take a lot of time to complete but it’s the perfect solution for keeping your files and their contents in the original state. Utilities bring a whole set of interesting tools and this is what sets apart this application from the rest. It allows you to check backups for errors, create a bootable media (like CD or USB drive), open image files on your computer and more. Before we conclude our segment on AOMEI Backupper Pro and its user interface, we will also take a look at the settings. This is important since this tells us how powerful and adaptable the software is in its current state. So, let’s take a look at Backupper’s Settings, found under the ‘Menu’ item (top right corner). Compression: This tab lets you set the level of compression for a backup. If you choose not to compress the backup, it will be created in no time but it will take a lot of space on your hard drive. Therefore, the default value is set to ‘Normal’ which moderately compresses the files. Splitting: Let’s say that you want to backup 10GB of data onto CDs that have around 650MB of free space. The only way to do that is by splitting the backup files. This is where you can do that. Notifications: You can set notifications if you want to know about the state of your backups. For example, if you’re away from your computer. 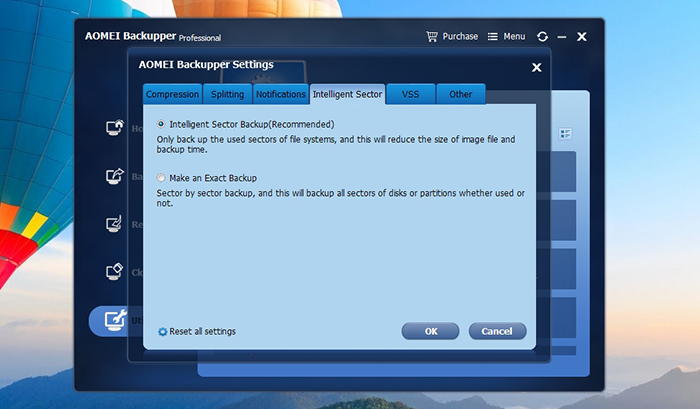 Intelligent Sector: AOMEI Backupper Pro comes with an intelligent tool that only backs up used sectors of file systems, which creates a small file in the end. This is where you can disable or enable this option. VSS: In case you decide to use VSS, you will be using Microsoft’s backup technique that doesn’t interrupt operations in progress. This is a good way to make sure that your backup will be done without being interrupted by Windows Update or similar software. Other: The final option brings several tools that affect your user experience. AOMEI Backupper Pro does pretty much everything on its own. Very little user input is needed, which a rare thing for today’s backup software. Our Score: 9.5/10. While some of you might be experts when it comes to creating and restoring backups, there are also a lot of inexperienced users. Therefore, we are going to guide you through the creation of the first backup. As you’ll soon see, AOMEI Backupper Pro is a very intuitive tool. We’ll show you how to create a backup of your files. To restore a backup, click on ‘Restore’ in the left placed sidebar. Select one of the available backup points and click on ‘Next’. That’s it. AOMEI Backupper Pro will restore the files. Please note that this won’t delete the existing backup point, so you can always return to it and manually delete it. Depending on the type of backup, the process can be very fast or can take some time. In comparison to similar tools, AOMEI Backupper Pro is one of the faster tools that’s also easy on your computer. Our Score: 10/10. 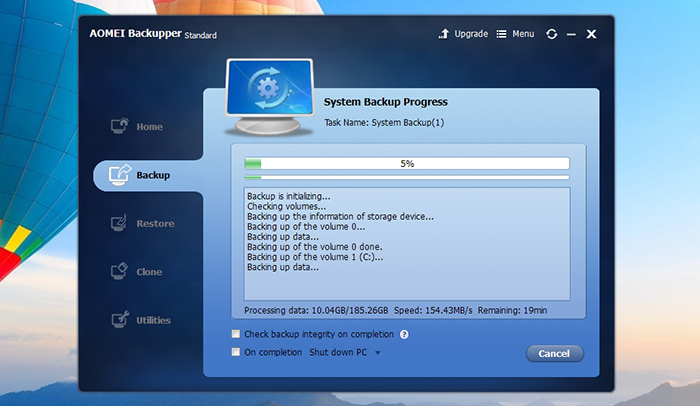 Backups can usually take a lot of time, especially if you want to include your operating system or your hard drive. However, this application allows you to fine-tune your user experience by visiting the Settings. This is where you can decide on the type of file compression, which is an important factor when it comes to speed. Files that are compressed take less space on your drive but they also prolong the entire process. Therefore, it’s a good thing that you can decide on the option that suits you. In our tests, AOMEI Backupper Pro was able to backup the entire system in around 25 minutes, which is a good result. However, this process is affected by a range of different factors. For example, how powerful is your computer in terms of processing power. All in all, you should know that this tool will help you get the job done quality, without affecting the rest of your system. There are numerous ways to get in touch with the company’s support team. In addition, extensive documentation awaits as well. Our Score: 10/10. If you want to learn about this software, the best way to start is by clicking on Menu > Tutorials within the app. A new Web page will open with explanations of every single tool and feature that you can use. This is a good way to really get to know the full extent of AOMEI Backupper Pro. There is also a dedicated support page with different types of information. You can check online help documents, read frequently asked questions, check out the official forum, or contact one of the company’s representatives. When it comes to talking to a real person, you can either write an email or call the company directly. We strongly believe that even complete newbies won’t have a hard time using this software. It’s intuitively designed and allow you to get the job done easily. However, it’s always helpful to have support in case of questions, problems, or doubts. Even though you can get started for free, the Pro version is priced at $49.95. This is a one-time purchase that grants you lifetime free upgrades. Our Score: 9.5/10. In terms of the pricing, AOMEI Backupper Pro is affordable when compared to similar solutions. This is especially prominent in comparison to cloud backup services which feature subscription-based plans. 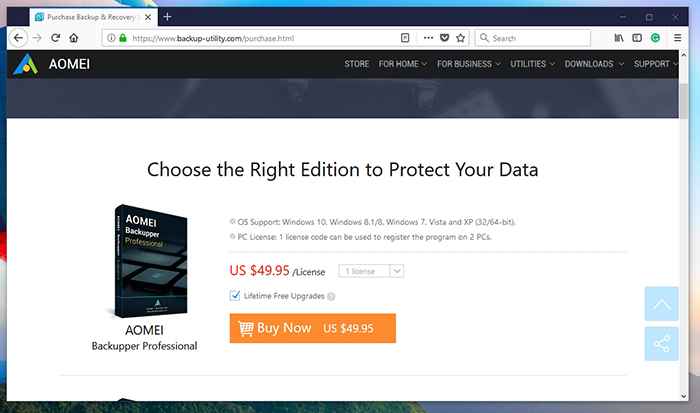 For $49.95, you can buy the software and keep it on your computer forever. This means that you’ll make sure to have a viable backup/restore solution at any moment, on a single computer. In case you need multiple licenses, you will find some attractive discounts. For example, you can obtain 2 licenses for $80 and 3 licenses for $105. There are multiple payment options suitable both for individuals and businesses. 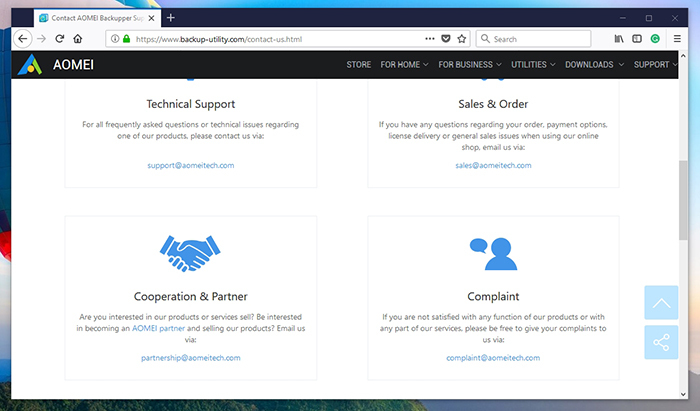 When it comes to creating locally stored backups and restoring those, you should know that AOMEI Backupper Pro is the perfect solution. In terms of the available features, there’s nothing more we’d like to see included. It all comes in a nicely designed and easy to use package. PROS: Suitable for inexperienced users; Nicely designed UI (a bit outdated though); A complete set of features; Support backing up, restoring, and cloning. CONS: Only for creating locally stored backups. We hope that you found this review to be useful, as well as that you’ll take care of creating regular backups in the future. Don’t let your work or digital memories go to waste – especially because AOMEI Backupper Pro is the perfect solution. If you have any questions, don’t hesitate to post a comment below. In addition, feel free to share this article online with your friends and family. Thanks! 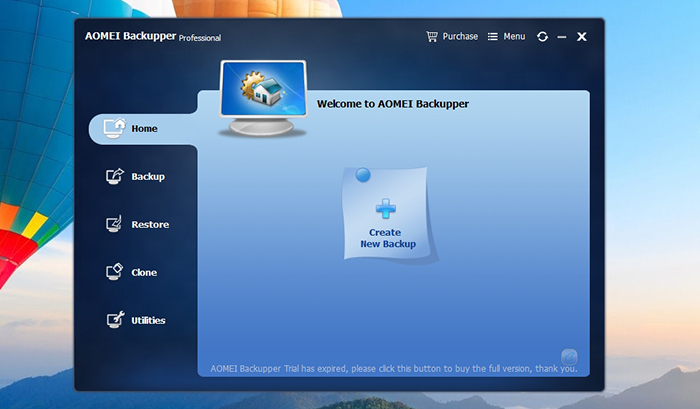 AOMEI Backupper Pro is the answer to creating locally stored backups. This highly polished application can get the job done in no time, with minimum user input. Needless to say, this is close to perfection.